¿Qué es The Game of the Year? "The Game of The Year" is an initiative launched by the Fundación Baloncesto Colegial in collaboration with the Dirección General de Deportes y Juventud de la Comunidad de Madrid and American Space aimed at Bilingual Secondary Schools throughout Madrid in which we intend to use basketball as a tool to foster a sense of belonging, school spirit, and healthy competition between schools by building off the values ​cultivated in athletics as a whole, but particularly in basketball which is without a doubt the best collegiate sport ever invented. This initiative first began in 2009 and after a few years off it is back and better than ever! With the sponsorship and support of the great Joe Arlauckas, the program now includes promotional Pep Rallies and various "Games of the Year" between different participating secondary schools... The games will live up to their name of "The Game of The Year" with gatherings based off of the school spirit produced in American High Schools. Filling the stands with students cheering for their team alongside their classmates, cheerleaders and a mascot with all excitement that is unique to high school basketball will be an unforgettable experience. As they face off against co-ed teams from other schools, they will be playing to win a "Game Banner," a prize that will undoubtedly become one of the most prestigious in high school basketball in Madrid for the winners. 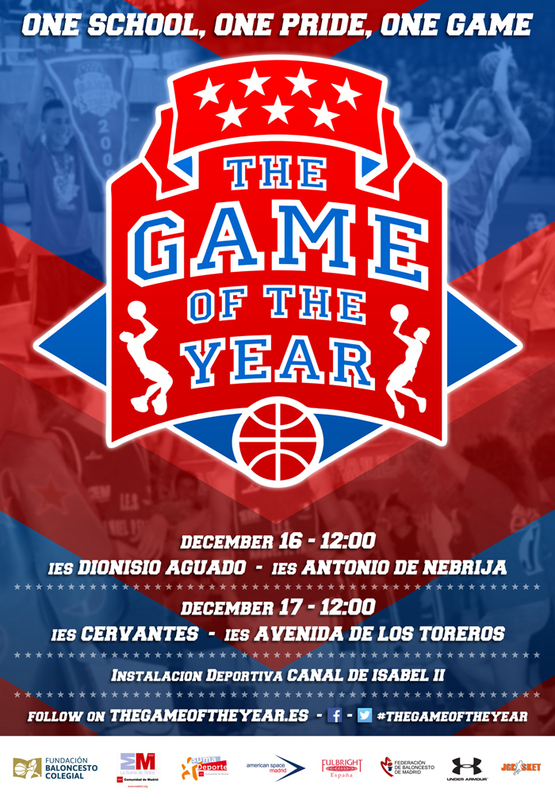 “The Game of The Year” es una iniciativa de la Fundación Baloncesto Colegial en colaboración con la Dirección General de Deportes y Juventud de la Comunidad de Madrid y American Space dirigida a Institutos Bilingües de Madrid en la cual pretendemos, con el baloncesto colegial como herramienta, potenciar el sentido de pertenencia, el espíritu colegial, la sana competencia deportiva entre centros educativos y aprovechar lo valores que el deporte en general y en particular baloncesto, sin duda el mejor deporte colegial que se haya inventado nunca, poseen. Partidos que van a hacer honor a su nombre “The Game of The Year”, con un montaje basado en el espíritu colegial de las High School americanas, con las gradas llenas de un público colegial volcado con sus jugadores y compañeros, con animadoras, mascotas y todo el colorido que hace único al baloncesto colegial van a ser una experiencia inolvidable, y que enfrentarán a equipos mixtos representativos de los institutos con el “Game Banner“ un trpfeo que sin duda se convertirá en uno de los más prestigiosos del baloncesto colegial madrileño como premio para los vencedores.